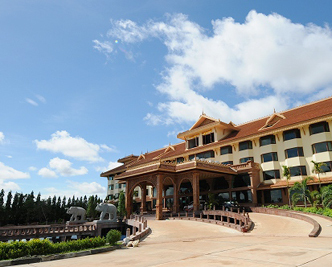 The luxurious 5-star hotel personifies the voice of an era founded by powerful Khmer kings. Not only are the designs intricately fashioned after ancient royal architecture, our facilities are meticulously arranged to propitiate our guests like royalties. Savor a true taste of Angkor hospitality at our hotel and be pampered by Kingly cordiality. The Angkorian era began in the 9th century in 802 C.E. when King Jayavarman II declared himself as God-King, the supreme sovereign of the Khmer people. Angkorian architects and sculptors created the temples in direct reflection of the cosmic world. Khmer decorations drew inspiration from religion and mythical creatures from Ancient mythology. Every detail was designed and built in accordance to the rules of ancient Khmer architecture that ensure longevity and good fortune. Here at Angkor Era hotel, we strive to recreate the good omens and spice them up with unsurpassed hospitality to ensure that our guests deserve royalty pampering and leave us lingering to return for more. Angkor Era Hotela in larger map.